The Australian Green Tree Frog, simply Green Tree Frog in Australia, White’s Tree Frog, or Dumpy Tree Frog (Litoria caerulea) is a species of tree frog native to Australia and New Guinea, with introduced populations in New Zealand and the United States. The species belongs to the genus Litoria. It is physiologically similar to some species of the genus, particularly the Magnificent Tree Frog (Litoria splendida) and the Giant Tree Frog (Litoria infrafrenata). The Green Tree Frog is larger than most Australian frogs, reaching 10 centimetres (4 inches) in length. The average lifespan of the frog in captivity, about sixteen years, is long in comparison with most frogs. Green Tree Frogs are docile and well suited to living near human dwellings. They are often found on windows or inside houses, eating insects drawn by the light. The Green Tree Frog shares the Litoria genus with dozens of frog species endemic to Australasia. The common name of the species, "White’s Tree Frog", is in honour of John White’s first description in 1790. The Green Tree Frog was the first Australian frog scientifically classified. The species was originally called the "blue frog" (Rana caerulea) despite its green colour. The original specimens White sent to England were damaged by the preservative and appeared blue. The colour of the frog is caused by blue and green pigments covered in a yellow layer; the preservative destroyed the yellow layer and left the frog with a blue appearance. The specific epithet, caerulea, which is Latin for blue, has remained. The frog is also known more simply as the "Green Tree Frog." However, that name is often given to the most common large green tree frog in a region, for example, the American green tree frog (Hyla cinerea). The Green Tree Frog can grow up to 10 centimeters (4 inches) in length. Its color depends on the temperature and color of the environment, ranging from brown to green; the ventral surface is white. The frog occasionally has small, white, irregularly shaped spots on its back, up to five millimeters in diameter, which increase in number with age. The frog has large discs at the end of its toes, of about five millimeters in diameter at maturity. These help the frogs grip while climbing and allow them to climb vertically on glass. The eyes are golden and have horizontal irises, typical of the Litoria genus. The fingers are about one-third webbed, and the toes nearly three-quarters webbed. The tympanum (a skin membrane similar to an eardrum) is visible. The Green Tree Frog is sometimes confused with the Magnificent Tree Frog (Litoria splendida), which inhabits only north-western Australia and can be distinguished by the presence of large parotoids and rostral glands on the head. The Giant Tree Frog (Litoria infrafrenata) is also sometimes confused with the Green Tree Frog. The main difference is a distinct white stripe along the edge of the lower jaw of the Giant Tree Frog, which is not present in the Green Tree Frog. The tadpole’s appearance changes throughout its development. The length of the species’ tadpoles ranges from 8.1 millimeters (once hatched) to 44 millimeters. They are initially mottled with brown, which increases in pigmentation (to green or brown) during development. The underside begins dark and then lightens, eventually to white in adults. The eggs are brown, in a clear jelly and are 1.1–1.4 millimeters in diameter. Although frogs have lungs, they absorb oxygen through their skin, and for this to occur efficiently, the skin must be moist. A disadvantage of moist skin is that pathogens can thrive on it, increasing the chance of infection. To counteract this, frogs secrete peptides that destroy these pathogens. The skin secretion from the Green Tree Frog contains caerins, a group of peptides with antibacterial and antiviral properties. It also contains caerulins, which have the same physiological effects as CCK-8, a digestive hormone and hunger suppressant. Several peptides from the skin secretions of the Green Tree Frog have been found to destroy HIV without harming healthy T-cells. The Green Tree Frog is native to northern and eastern regions of Australia and to southern New Guinea. Distribution is limited mostly to areas with a warm, wet tropical climate. In New Guinea, the Green Tree Frog is restricted to the drier, southern region. Its range spans from Irian Jaya to Port Moresby, and is most abundant on Daru Island. There have been isolated records in northern New Guinea, however this is thought to have been through introduction by humans. The International Conservation Union (IUCN) suggests "scattered locations" in both New Guinea and Indonesia. The species has been introduced to both the United States and New Zealand. In the United States, it is restricted to two regions within Florida, where it was possibly introduced through the pet trade. Only small populations have been found in Florida, and it is unknown whether they have caused any ecological damage as an invasive species. In New Zealand, a population was once present; however, there have been no sightings since the 1950s. Green Tree Frogs are very docile. They are nocturnal and come out in early evenings to call (in spring and summer) and hunt at night. During the day they find cool, dark, and moist areas to sleep. During winter, Green Tree Frogs do not call and are not usually seen. Depending on their location, Green Tree Frogs occupy various habitats. Typically, they are found in the canopy of trees near a still-water source. However, they can survive in swamps (among the reeds) or in grasslands in cooler climates. Green Tree Frogs are well known for inhabiting water sources inside houses, such as sinks or toilets. They can also be found on windows eating insects. They will occupy tanks (cisterns), downpipes (downspouts), and gutters, as these have a high humidity and are usually cooler than the external environment. The frogs are drawn to downpipes and tanks during mating season, as the fixtures amplify their call. The species’ call is a low, slow Brawk-Brawk-Brawk, repeated many times. For most of the year, they call from high positions, such as trees and gutters. During mating season the frogs descend, although remaining slightly elevated, and call close to still-water sources, whether temporary or permanent. Like many frogs, Green Tree Frogs call not only to attract a mate. They have been observed calling to advertise their location outside the mating season, usually after rain, for reasons that are uncertain to researchers. They will emit a stress call whenever they are in danger, such as when predators are close or when a person steps on a log in which a frog resides. The species’ diet consists mainly of insects and spiders, but can include smaller frogs and even small mammals. Frog teeth are not suited to cutting up prey, so the prey must fit inside the mouth of the frog. Many frogs propel their sticky tongues at prey. The prey sticks, and is consumed. A Green Tree Frog will use this technique for smaller prey; however for larger prey, it pounces, then forces the prey into its mouth with its hands. The frog has a few native predators, among them snakes and a few species of lizards and birds. Since the European settlement of Australia, non-native predators have been introduced, primarily dogs and cats. The species has an average life expectancy in captivity of sixteen years, but some have been known to live for over twenty years, which is long for a frog. The average life expectancy in the wild is lower than in captivity, due to predation. The Green Tree Frog is one of the most popular pet frogs throughout the world. Its docile nature, often cartoon-like appearance, and long life expectancy make it an attractive choice for exotic-pet owners. It is also one of the easier frogs to care for: their diet is broad and they have a strong resistance to disease. 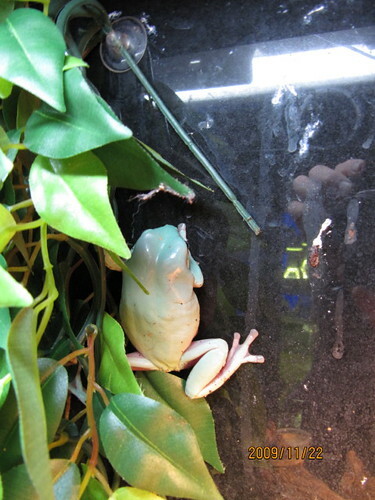 One problem commonly associated with keeping this species as a pet is overfeeding; Green Tree Frogs tend to become obese if overfed. In the wild, exertion of energy is required for a frog to capture its prey. However, in captivity they are usually given live feed in a confined space. This lessens the activity needed for feeding, resulting in weight gain. An overweight member of the species will deposit fat layers over the top of the head and body, giving it "dumpy" appearance. Thus the name, "Dumpy Tree Frog." Australian law gives protected status to the Green Tree Frog – along with all Australian fauna – under the federal Environment Protection and Biodiversity Conservation Act 1999. The IUCN lists it as a "least concern" species, given its broad range and population, balanced habitats, and because it is likely not declining fast enough for more threatened status. Much of the Green Tree Frog’s natural habitat has been destroyed. Also, some of the frogs have been found infected with chytrid fungus (causing chytridiomycosis). These two factors associated with the general decline in frog populations in Australia threaten to reduce the population of the Green Tree Frog. However, because of the long life expectancy of this species, any effects of a reduced reproduction rate will take longer to spot than they would in a species with a shorter life expectancy.